The AG underscored his office has “obtained a number of successful noncitizen voter fraud convictions,” including Rosa Ortega in Tarrant County, Laura Garza in Montgomery County, and Marites Curry in Navarro County. In 2017, Texas tried Ortega, a Mexican national, for voting illegally in elections over a decade. She falsely claimed U.S. citizenship and voted as a Republican at least five times in Dallas County. This included the November 2012 general election and a May 2014 primary run-off. During her trial, Ortega said she thought she was an American citizen when she was only a U.S. legal permanent resident, which rendered her ineligible to vote. A judge sentenced her to eight years in prison for “illegal voting” under Texas law. Last year, Garza pleaded guilty to voter fraud charges for voting in three election cycles, including 2016. She did so by stealing a Texan’s identity to obtain a U.S. passport and Social Security number. The American citizen victim learned about the fraud when she tried to apply for a passport in her own name and discovered Garza already did. Garza received 10 years in jail, after which she will be deported. This month, Breitbart News reported Paxton’s office indicted noncitizen Curry for illegally voting in the November 2016 general election following an investigation by the AG’s election fraud unit. 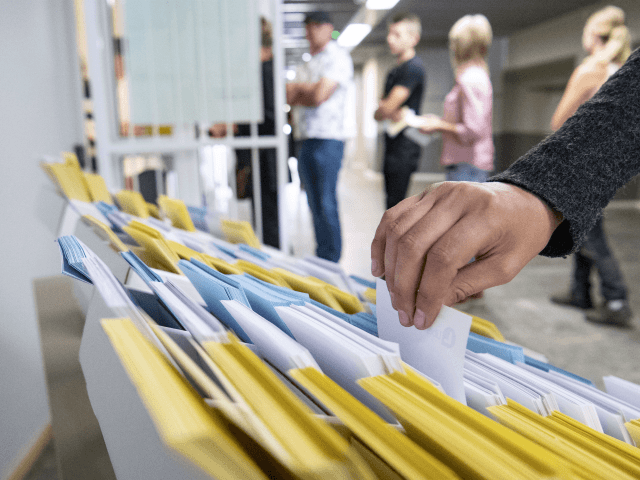 In 2018, Paxton announced a significant voter fraud initiative, which addressed key problems and policies related to election law. The AG’s election fraud unit, with the assistance of a criminal justice grant from the office of Texas Governor Greg Abbott, prosecuted 33 defendants for a total of 97 election fraud violations, including noncitizen voting cases. The @TXAG: 95,000 noncitizens are registered to vote in Texas–61% cast ballots. The Left pushed overly aggressive policies that exposed non-citizens to voter registration. Are their deportation risks worth it @lawyersdf @Demos_Org and @ProjectVote? The organization issued a complaint in October 2018 to the State of Texas about the local Democratic Party allegedly sending pre-filled voter registration applications to noncitizens in the Rio Grande Valley, encouraging them to vote in the upcoming midterm elections. The mailers purportedly arrived with the U.S. citizenship box pre-checked. The SOS referred the matter to the AG’s office. State law permits lawfully present noncitizens to obtain drivers licenses by showing proof of lawful presence to DPS. However, only U.S. citizens are eligible to vote. Currently, Texas law does not require verification of a voter’s statement that they are a citizen. Illegal voting is a second degree felony in Texas. It is punishable by two to 20 years in prison and a fine up to $10,000. Under federal law, applicants for naturalization can be denied and potentially deported if they registered to vote prior to becoming a citizen.